In terms of DLC, Episode Prompto is an experience of its own. It feels complete and fleshed out in its two hour play time and it delivers on its promise of giving a deeper look into Prompto. 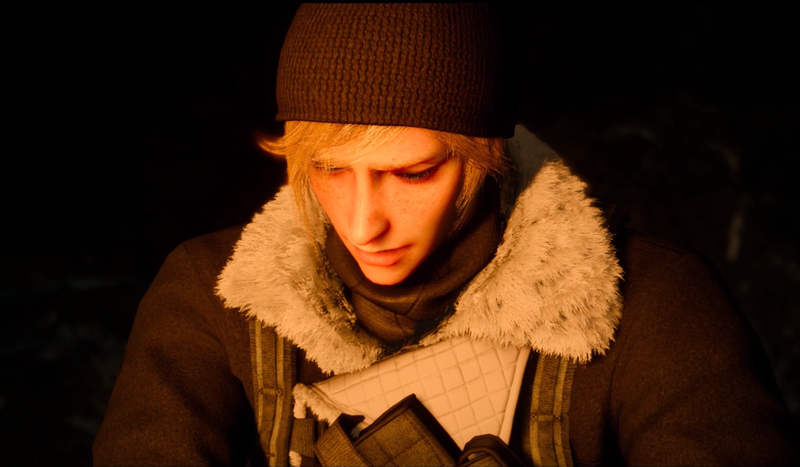 Episode Prompto is the strongest of the two pieces of Final Fantasy XV story DLC to date and gives much needed background to events that happen later in XV’s main story. Along with being able to play shooting mechanics very true to Prompto’s fighting style and having a decently detailed map to explore with different exploration methods, Episode Prompto feels like a well-rounded experience for a pretty reasonable price and this fleshed out DLC feels very much like a worthwhile chapter of its own. Prompto’s journey takes place fittingly from when he is separated from the group after Ardyn’s trick leaves him stranded and questioning his friendships. His main mission in Episode Prompto is to make his way out of captivity, but it’s also a battle of personal demons as he struggles to come to terms with his past. If you've seen the Final Fantasy XV Brotherhood anime or certain in-game cutscenes with Prompto, you'll know he already has some insecurities and the Prompto in this episode is still the happy one we know, but it mostly sticks to exploring the more emotional side of his character. Prompto was always a character I thought was developed enough thanks to his Brotherhood episode, but I liked watching him grow throughout Episode Prompto’s journey much more than I had anticipated. Despite being two hours long, the story has a clear plot points with conflict and resolution, a start, middle and end, and while these are story fundamentals, in such a short amount of time, I really did feel like I went on an emotional journey with Prompto by the end of it. Like Gladiolus’ Episode, Prompto goes through a struggle and overcomes it, but to the merit of Prompto’s Episode, it features much more obvious highs and lows that made it really feel like its own Episode and even though other important characters are featured, Prompto is truly the main focus and I finished the Episode feeling a bigger connection to his character. 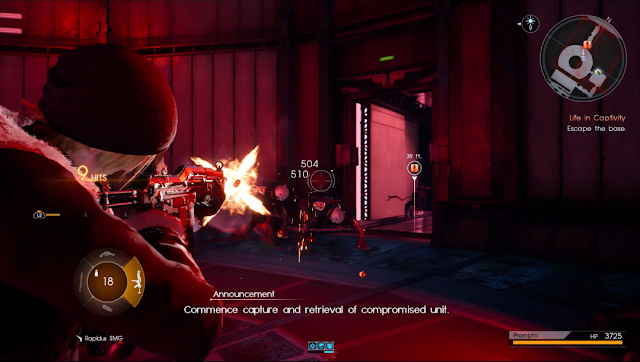 Since we know Prompto as the party’s shooter in Final Fantasy XV, Episode Prompto’s main fighting style is using third-person shooting mechanics and stealth, which suits Prompto’s goal of escaping captivity well. There’s a small variety of guns to use, such as rifles, sniper guns and even bazookas which all have their own specific purpose and were interesting to try out, even if shooting mechanics aren’t exactly my forte. I liked that since you can’t level up, choosing the right gun was the main strategy. Having to think of things such as if it was worth it to use up my super powerful sniper with limited ammo on a small group of enemies was an interesting new decision for me to make and I liked that were enough guns to give shooting variety, but not too much to be overwhelming. If shooting mechanics aren’t something you’re used to like myself, there is also the option of fighting melee style with a blade which came in handy many times I was surrounded by enemies and couldn’t decide which gun was best for the job. Prompto doesn’t have the same warp abilities as Noctis, but it was nice to have something more familiar to fall back on in sticky situations. 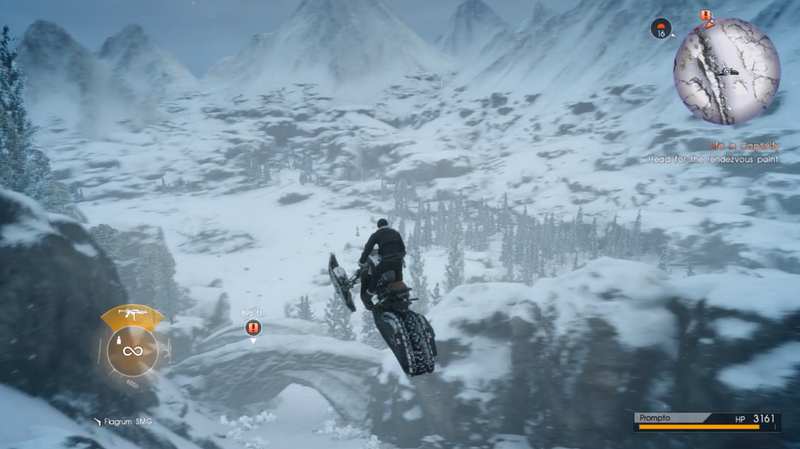 Along with new fighting mechanics, Episode Prompto features a new mode of transportation in the form of a snowmobile. Since I haven’t played the new update for XV, this was my first time driving off-road in XV and it was pretty cool, even if it wasn’t a perfect driving experience. I really liked driving downhills, speeding past enemies and occasionally taking them down with the vehicle and although the vehicle was much easier to control on downhill sections rather than rockier snow areas, it’s a novel vehicle choice that I’m really excited to try out more. One thing that really pleasantly surprised me about Episode Prompto were the reasons to explore its map. Hidden around the first area are a bunch of Research Logs that gave a deeper look into XV’s world and events that related back to Prompto. These logs provided lore that told their own story and made this side of XV’s world feel more fleshed out. There are even a few side quests to help Prompto upgrade the snowmobile and while I didn’t do many of these, the fact that any were included helps Episode Prompto feel like a deeper experience than the last Episode and it’s something I look forward to going back to if I decide to go back to play through Episode Prompto again. Side quests aren’t the only thing worth coming back to Episode Prompto for. Like Episode Gladiolus, there’s a Time Attack mode, but this time featuring a speed gem collecting time trial on the snowmobile to beat your own and others high scores. There’s also a battle with Episode Prompto’s co-star Aranea, which provides its own level of challenge with its lack of items and her powerful combat style that I was pleased to see differed a lot from the fight with Cor in Episode Gladiolus. With these features, a world with hidden lore and side quests, Episode Prompto feels like it really gave me a lot and as paid DLC, that’s something I very much appreciate. Episode Prompto is a big step in the right direction for story DLC in Final Fantasy XV and adds a lot for fans of Prompto and XV’s story. The journey I went on with Prompto in the two hour experience was one that was touching and while I didn’t cry like the trailer had me thinking I would, I left the experience liking Prompto more and feeling like I really did witness a full story by the end of it. Even though I still prefer the melee combat in XV, the shooting elements had a nice amount of strategy incorporated into them and I like the thought put into making the combat fit the world, along with the other little details that made the places in this DLC feel interesting. 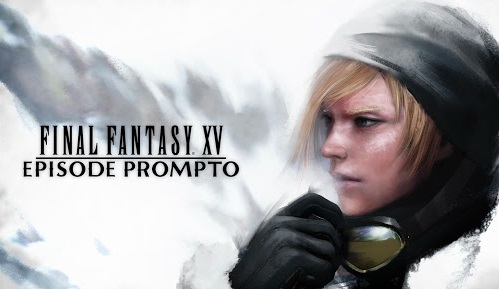 Episode Prompto may only be DLC, but the well-told story and experience is certainly in my top chapters for Final Fantasy XV and I hope it’s what can be expected of the next Episode to come. This score is much higher than my score in time attack. Will you try Episode Prompto? If you have, what did you think? Are you as excited as I am for Episode Ignis? I haven't played Final Fantasy 15 yet and I was honestly kinda sceptical of the planned story DLC. But after reading your two DLC reviews I am convinced that these shorter episodes were a good idea on Square Enix's part. But it would have been so easy for these episodes to just be dirty cash grabs, but luckily this seems to not be the case so far, which i am really happy about!